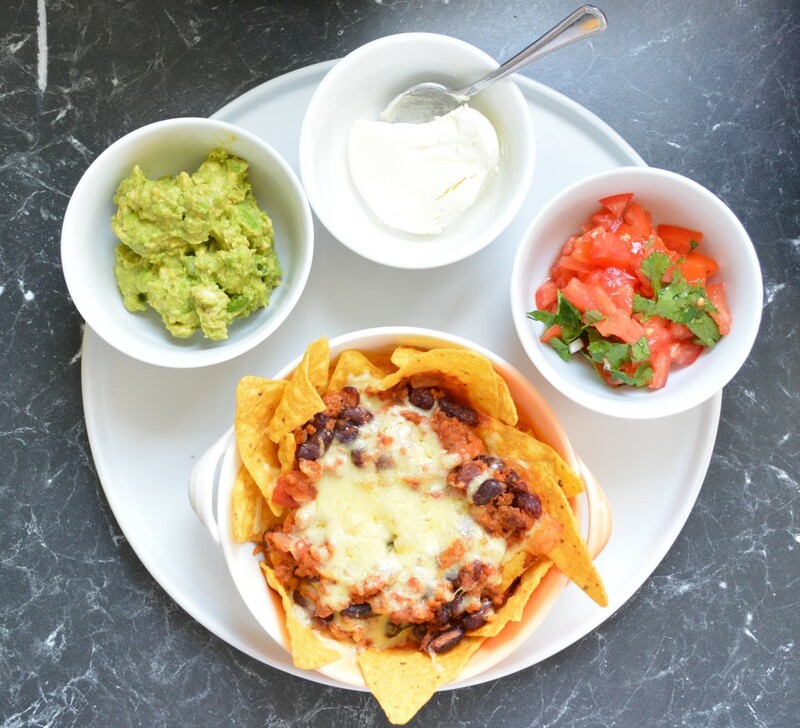 Nachos is something my kids absolutely love, make this and I have three very happy children. My husband on the other hand, does not appreciate it all, so this is something I make for my kids when my husband is not home for dinner. I love making this, as it is super simple to make, it is made relatively quickly, really, while your meat sauce cooks, you prep all you sides, so in about 40-45 minutes, dinner is on the table. That's pretty quick for me. 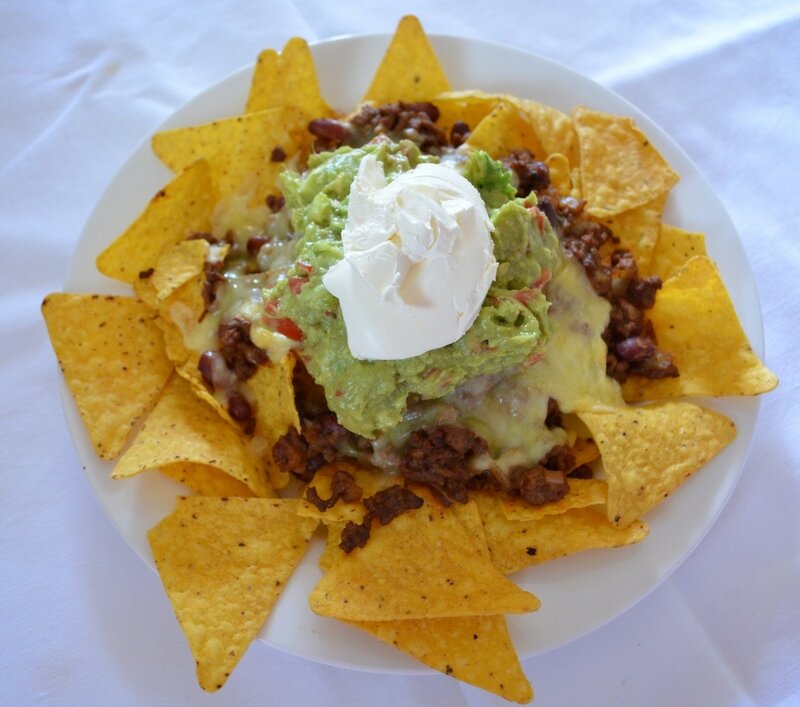 Now I love to double this recipe, as on the first day we have nachos, usually a Friday night, pub night for my husband, on the second day lunch is Tacos (just shred up some lettuce to add to the tacos), so we have a bit of a Mexican feast for two days. I also have found individual serving dishes which I love, as they look great and there is no more bickering on who got more. But feel free to make one large nachos dish to share, completely up to you on how you serve it. With the seasonings, this is how we like it. But after you taste the sauce, add more chilli, if needed, or any of the other spices. That is completely up to you, here the recipe is really just a guide. I love a mix of pork and veal/beef mince, but if you like just beef mince, use it, that is also up to you. So is you are looking for a fun, easy dinner idea, give this a go, we love it, hope you do to. Put a chef pan over a medium-high heat. Put the oil in the pan, add the garlic and onion and saute for 3-4 minutes, stirring, until the onions soften. Add the mince, cumin, coriander, paprika and chilli, break up any lumps in the mince with a wooden spoon. When the mince is separated and browned, add the tin tomatoes and simmer for 20 minutes. While the mince is cooking, make the guacamole. Peel and remove stone from the avocado, place the avocado flesh in a medium sized bowl, add the lemon juice. Using a fork, mash it all up. Add the shallots, season with a little salt and pepper, mix it well. Set aside until needed. After the mince has simmered for 20 minutes, add the red kidney beans, stir, continue simmering for 5 minutes. Meanwhile make the salsa. Add the diced tomato, shallots and the chopped coriander to a medium sized bowl, season with a little salt and pepper. Add a teaspoon of extra virgin olive oil, and the lemon juice. The dressing is to taste, so add the lemon juice in a bit at a time until you have the flavour you love. Mix together the tasty and mozzarella cheese. I add mozzarella, as tasty cheese alone as it cools hardens quickly, the mozzarella allows the cheese to melt better and become stretchy as it cools, for longer. To assemble, place an even amount of corn chips in the base of 4 individual serving dishes or in one large serving platter. I like to decorate the sides with larger corn chips so they stick out a little. Ladle over the mince evenly into the centre of the dish. Place the dishes onto an oven tray and place in the oven for 10-15 minutes until the cheese has melted and the corn chips have warmed up. Put the salsa, guacamole and sour cream in individual serving bowls and place on the table. ​Once the nachos are ready, serve immediately.